Big news, guys! 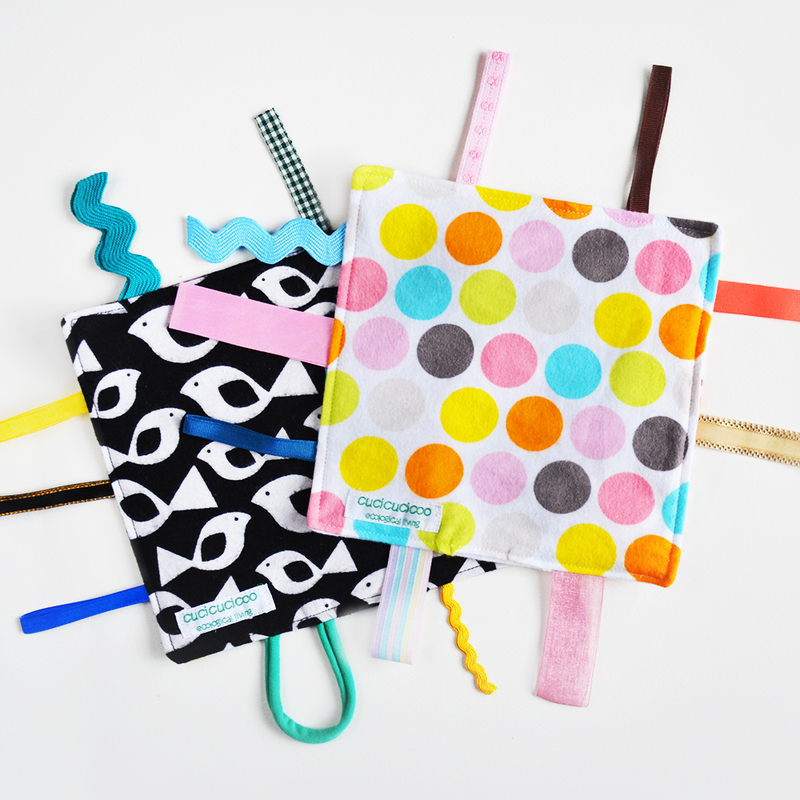 My pattern shop, Cucicucicoo Patterns, is just about ready to officially open! I’m just waiting on a few tax-related bureaucratic things before I can put items up for sale, but my first three PDF sewing patterns are ready! 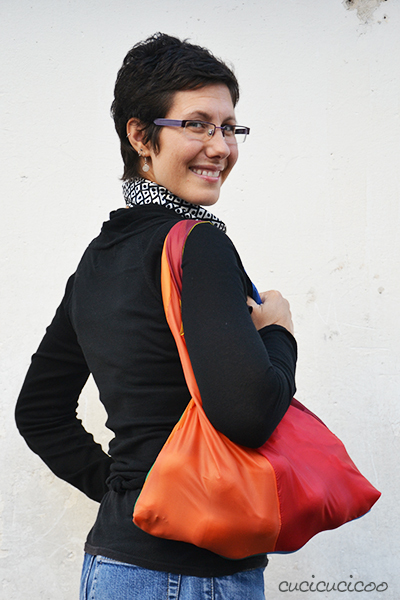 To celebrate, I’m sharing a FREE professional-quality sewing pattern with you: the Carry Everywhere Shopping Bag! Continue reading to find out how to get it! 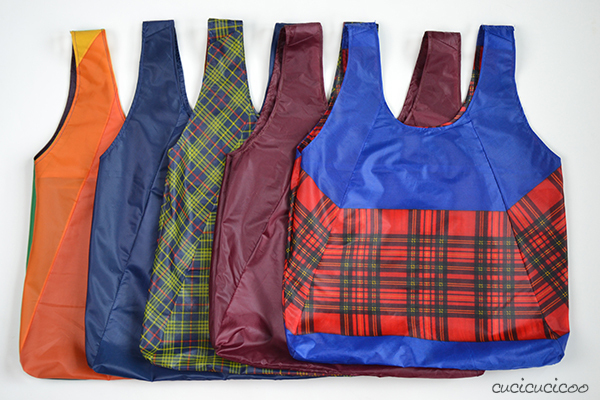 Now, I know that there are plenty of free shopping bag patterns out there, but I wanted to make the most useful shopper possible: a reusable shopping bag that you can have on hand at all times. How many times, while paying at a store, have you realized that you’ve forgotten your reusable grocery bags at home or in the car? The solution is a small and lightweight enough bag that you can carry around with you wherever you go, yet sturdy enough to pack full of heavy items (like the apples I was carrying for the photo above). 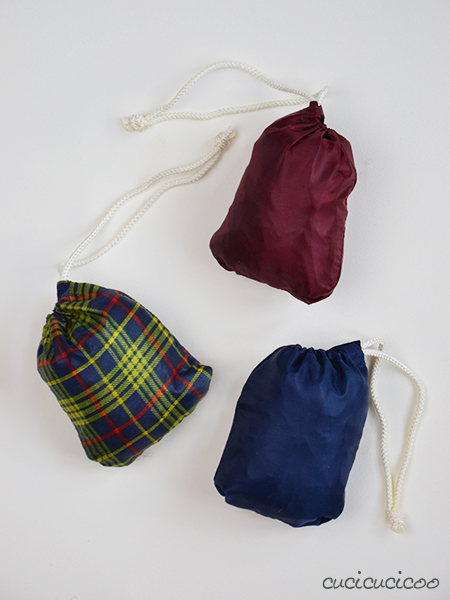 A bag that you can keep in your purse or backpack so that you’re always ready for bagging unexpected purchases. My solution? One word: umbrellas! 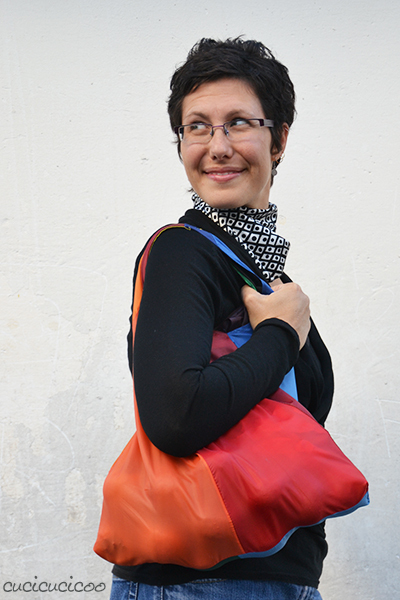 Thus was born the Carry Everywhere Shopping Bag, made from the fabric recuperated from broken umbrellas! Hey, why not?! Old umbrellas are free, so your bag costs nothing. 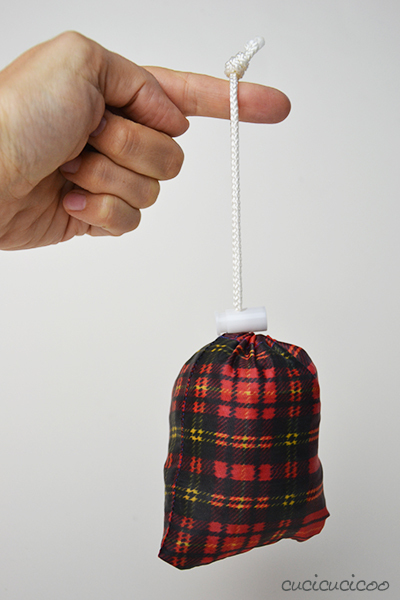 The fabric from umbrellas is very lightweight, so it makes a very light bag that can be compressed inside a small stuff sack. There are some really great colors and designs on some umbrellas, but even the ugliest umbrella makes a pretty cool-looking bag. And by using old umbrellas to make a bag, you are not only keeping them out of a landfill or incinerator (or from littering the street), you are also avoiding the use of the wasteful plastic bags that are so harmful to the environment and wildlife. It’s a win-win situation! 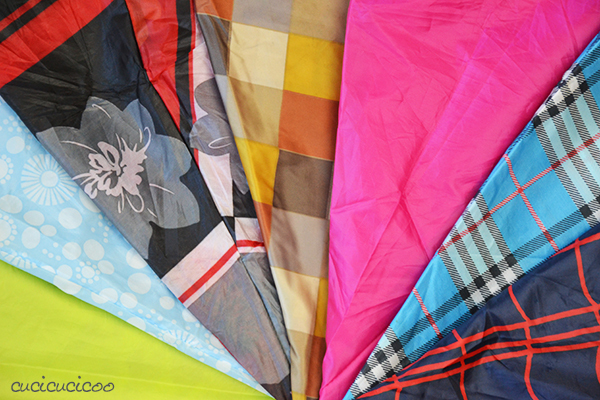 Of course, you don’t have to use upcycled umbrellas for your fabric. 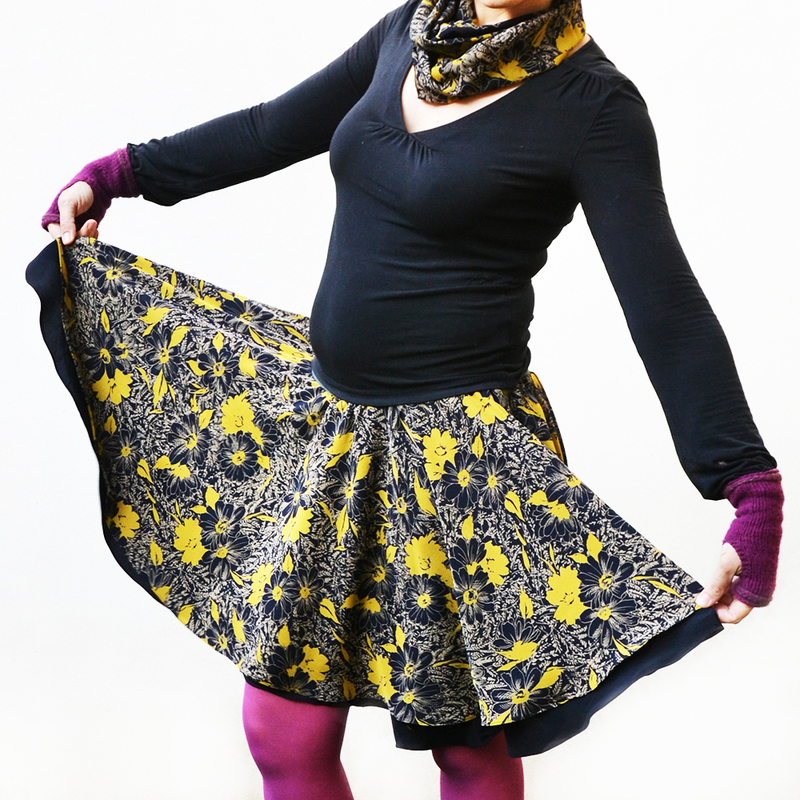 90 cm (35″) of any 120 cm- (47″-) wide lightweight fabric will work well, too for this pattern. (I used a regular woven quilting cotton remnant from Ikea for the bag pictured below.) 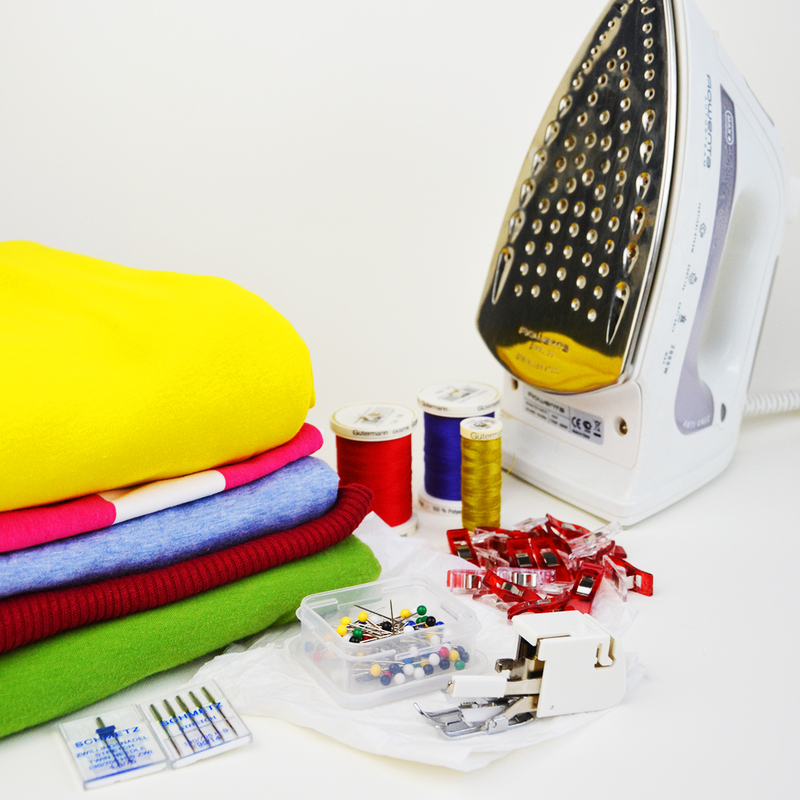 If you do decide to give new life to your old umbrellas, read this post on how to “harvest” the fabric from them. The style of this bag was inspired by the magnificent Chico Bag, a nylon bag that gets stuffed into an attached drawstring pouch. I’ve had and loved one of the original Chico Bags for years, but it has two downfalls, as far as I’m concerned: 1. They are available in very few countries outside of the United States (and don’t ship outside of the USA, last I checked) and 2. They are made with new synthetic fabrics, whose production requires energy, water and petroleum. 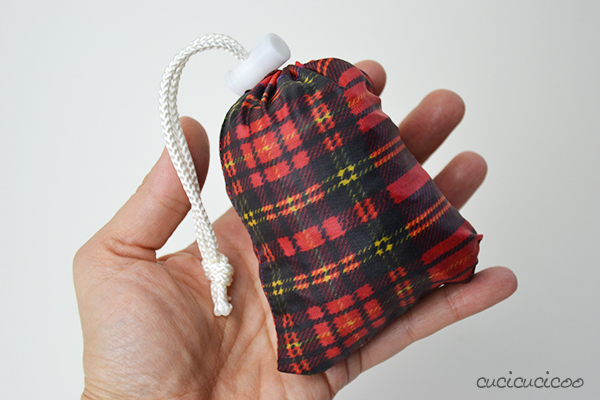 But I love the Chico Bag’s lightness and how easy it is to squash the bag into the little sack, which I never have to worry about losing. So I incorporated these features into my own bag design, and figured out how to make the bag out of the fabric recuperated from a single umbrella, using its original seams as a design element. 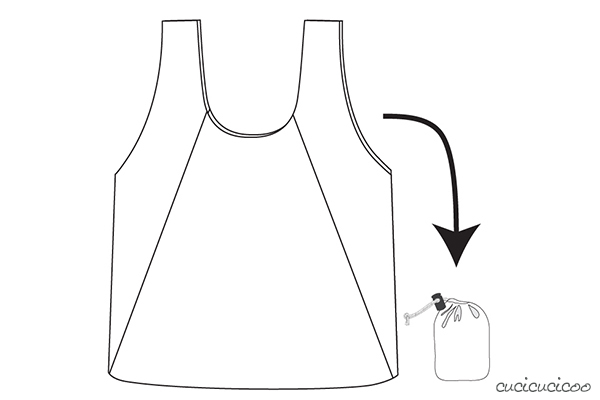 The PDF pattern (here’s a post on how to print them out) includes professionally-drawn pattern pieces and full instructions with fancy line drawings (like the one above) illustrating the steps. Aren’t those little sacks adorable? They weigh hardly anything and are so compact that you’ll never even notice them inside your everyday purse or bag! It’s hard to believe that there’s a whole shopping bag in there! No folding, just shove the whole bag in there! And if you want, you can add a cord lock onto the drawstring for even easier closing. Let’s get a little more technical inside the bag. The tops of the handles are sewn with felled seams and the bag sides and bottom are sewn with french seams, two techniques which easily create a clean, professional look while adding stability to the seams. The top handle area has two layers of fabric to make them extra strong. The bottom corners are boxed, to let items fit inside the bag better without any weird pointy corners. And here you can see how the stuff pouch is sewn right into the bag’s inside seams. But, if you’re a beginner, don’t get scared off by all those technical terms (like felled seams, which you can see in the photo above)! They’re all explained clearly in the instructions and, where necessary, there are links to tutorials for more information. 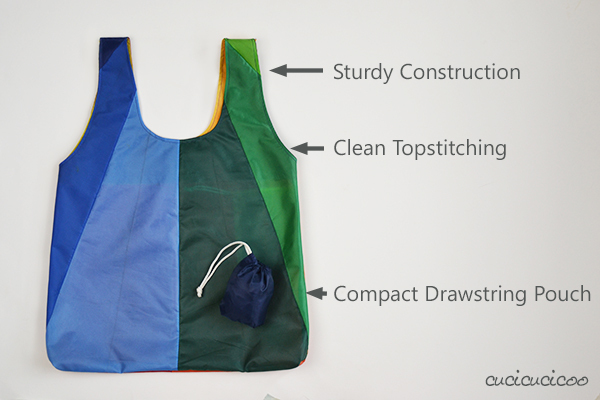 As fancy as this bag looks, it’s actually pretty simple to put together. It’s been rated Intermediate level, but this is only because of the slightly slippery umbrella fabric, and even a beginner sewer can make these! 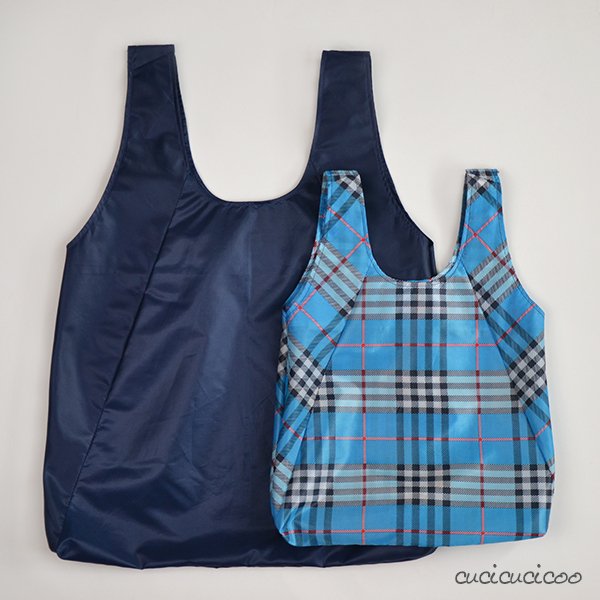 In order to make the full-sized Carry Everywhere Shopping Bag (55 cm/22″ high), you will need the fabric from one full-sized umbrella. 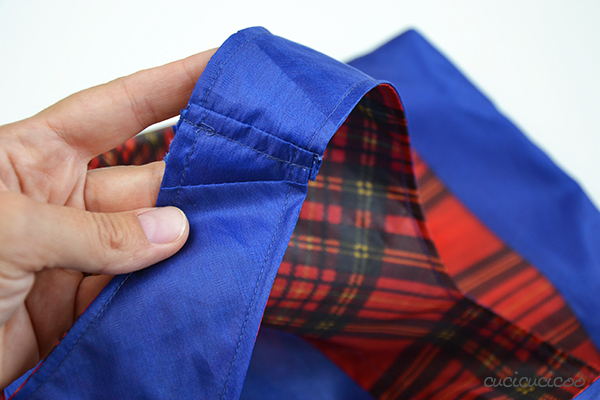 If you only have compact fold-up umbrellas to take apart (like the type that you can easily fit inside your bag), you can either use two of them for a single full-sized bag, or resize the pattern pieces to fit on the fabric of just one smaller umbrella. In the picture above you can see one full-sized Shopping Bag and another one with a pattern resized to 75%. 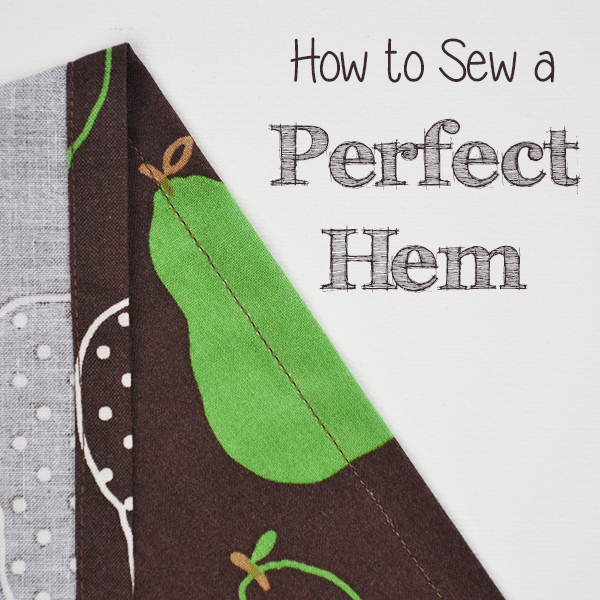 Want to know how to get this FREE shopping bag pattern? Easy! 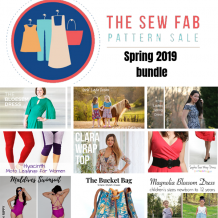 Just sign up for the Cucicucicoo newsletter to receive all blog posts plus extra free patterns and materials for sewers and crafters by email, and you’ll get this pattern for FREE right then and there! Then you can enjoy aweing people in checkout lines when you pull out your fun and colorful shopping bag from a tiny little pouch, and swing it right over your shoulder! Don’t forget to share pictures of your Carry Everywhere Shopping Bag in the Cucicucicoo Creations Flickr group, on the Cucicucicoo Facebook page, or on your blog or social media using the hashtag #carryeverywhereshoppingbag! I can’t wait to see your amazing bags! This pattern went through two rounds of testing, once in English, then in Italian, in order to perfect it. 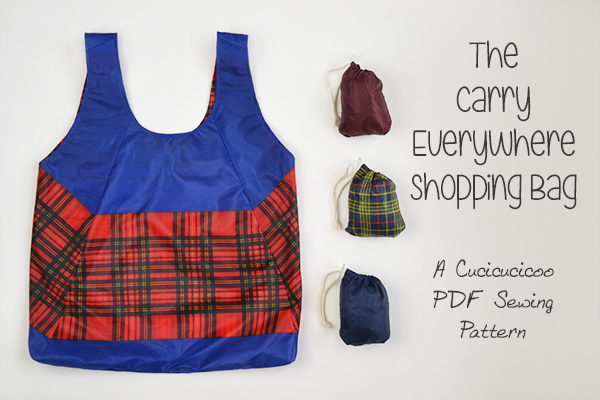 (If you’d like to become a Cucicucicoo pattern tester, sign up here!) 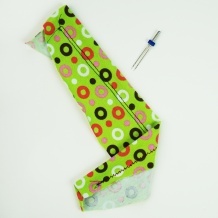 Want to see the lovely bags that some of my testers have made with this pattern? 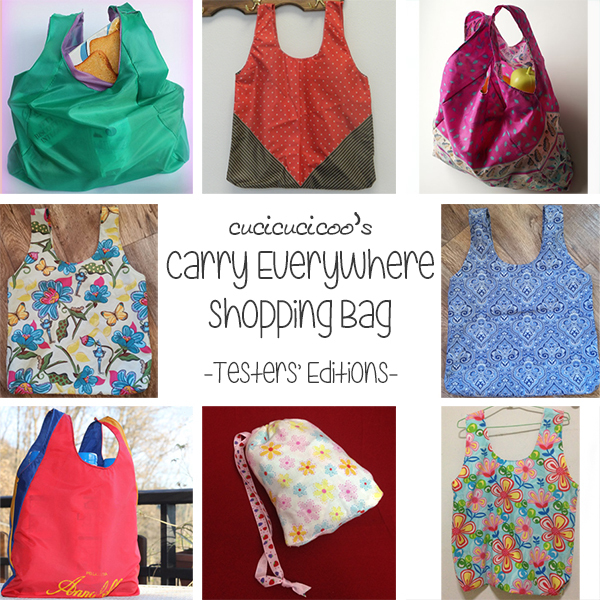 Over the next few days, the following talented ladies will be showing off their versions of the Carry Everywhere Shopping Bag! So what are you waiting for? 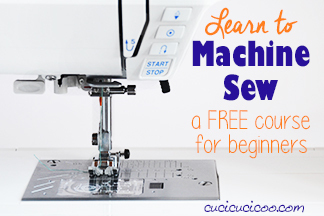 Go get your free pattern and sew these up for everyone you know! Pinnata subito per condividerla con tutti! Fantastica, parola di tester ! Nice to see the Carry Everywhere Shopping Bag released!! You did a lot of work!! Thanks for letting me participate in the testing!! Sono contenta che ti piaccia, Alessandra! Lisa, this looks fantastic. Can’t wait to look through the pattern. And then need to find some umbrellas! Because I am definitely making this. I signed up for your site, but cannot find the pdf pattern for the bag. I just love the look of it, and have lots of old, really nice umbrellas that I could use. Please advise how I can get the pattern. Looking forward to more great things on your site. I have now received an email to receive the pattern. Thank you. Looking forward to making it. Oops, we were writing to each other at the same time! So glad that you got it Ok! Sorry about the delay!! Brilliant use of an old umbrella! 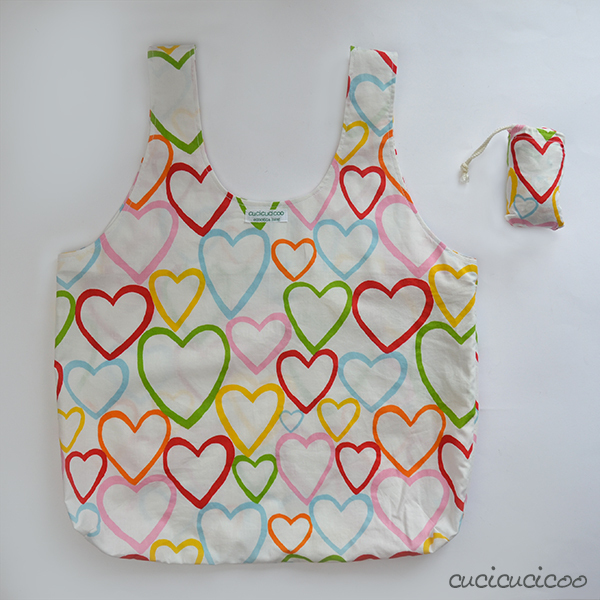 Ciao Lisa!, che utile la tua shopping bag! Mi piace. Che programma utilizzi per fare la foto con tutte le borse insieme? Ciao, Dama, e grazie! Uso Photoshop per tutte le mie foto, ma ci sono anche alternative gratuite per fare collage del genere, tipo Pic Monkey, fra altri. 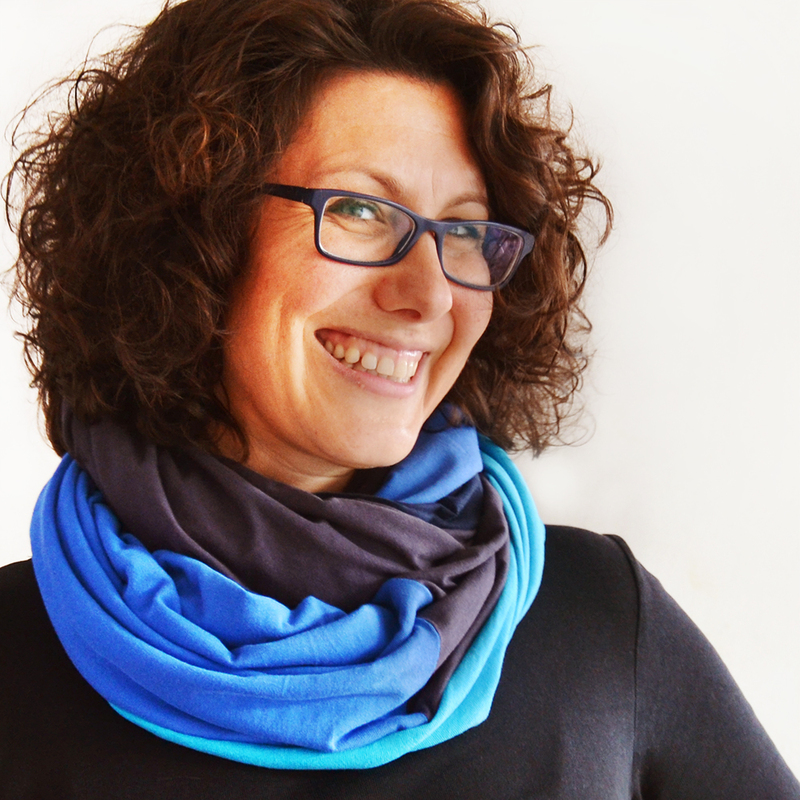 Ciao Lisa, sono anni che cerco nuovi modelli per riutilizzare i tessuti di ombrelli rotti! Che soddisfazione nei negozi tirare fuori queste borsette autoprodotte! Divertenti le espressioni delle impiegate quando spiego loro che “prima erano ombrelli”. Mi sono decisa ultimamente a scomporre un sacchetto di plastica e vedere come tagliare in maniera differente la stoffa e per provare ad ottenere una shopper che abbia una maggiore capienza in profondità. Proverò anche il tuo modello. Grazie mille. Grazie mille per il cartamodello!! E’ da molto che volevo fare una borsa così e adesso finalmente ho questo super cartamodello! Sei veramente bravissima e i tuoi lavori sono tutti bellissimi!! Ma come fai a fare così tante cose? Mi sa che non dormi di notte!!!!!! Grazie ancora. Perfetto! Sono contenta che il mio modello è la risposta che cercavi, Rosy! Grazie mille del cartamodello!!! è un pò che seguo il tuo blog ed è molto molto bello ed interessante. ho appena scaricato il cartamodello… ho giusto un ombrello qua davanti a me che non aspettava altro se non essere riutilizzato!!!! Bellissime! Spero di diventare abbastanza brava con le tue lezioni da riuscire a farla! Grazie mille per avermi insegnato le basi del cucito!! Ti rispondo in privato, Sara! These are so cute — I love the whimsical designs with all of the fabric types. And yes they are so very handy! I love my cotton bag, but it’s true that the lightweight-yet-sturdy nylon is ideal to keep in your bag at all times. Great, great idea to upcycle the umbrella fabric! Whimsical! That’s a nice way to put it! 🙂 Well, Linda, next time I see you, you’ll get one of these, too! Lisa, really lovely post and congratulations on a very well done pattern! Thanks, Judy, also for your wonderful post (which I already commented on and shared yesterday) ! I’m so glad you were a part of the process! volevo segnalarti che il link per iscriversi alla newsletter da errore. Un bacione, complimenti per questte shopper e buonissima giornata. Ciao Lisa, sì sì adesso funziona! Grazie cara, lo segnalo presto su Creatività Organizzata, è un tutorial molto utile! P.s. bellissima quella con il tessuto Ikea. Ah, bene! Sono contenta che ha funzionato! Ti ringrazio molto per la prossima segnalazione! 🙂 un abbraccione! Ciao, Sara! Sono contentissima! Ottima idea di recuperare il poncho! Mi fai vedere una foto? Sono molto curiosa di vederla! 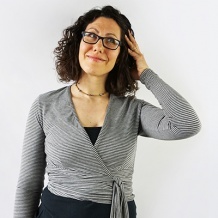 Puoi postare la foto sulla pagina Facebook, il gruppo Flickr, o inviarmela a lisa@cucicucicoo.com! Un abbraccio! ciao forse è troppo tardi ma volevo da te il cartamodello per la borsa fatta da pezzi di ombrelli. Peccato ! I have been looking for such a pattern FOREVER – thank you so much!! I signed up for your newsletter just to get it, but nothing has come through yet. What’s the turn-around on that? Oh, I’m so glad, Candi! Did you check your spam folder? You need to click on a link in an activation email to activate your subscription. It should’ve arrived more or less immediately. If you can’t find it, write me an email (lisa@cucicucicoo.com) from the email address you used, and I’ll check out the situation for you. avrei bisogno del cartamodello della borsa fatta con gli ombrelli come posso averlo? Ciao Lisa,grazie per avermi accolto fra le tue fan, ho gia scaricato il cartamodello della shopper e presto lo utilizzero’; ho giusto degli ombrelli in attesa di una “nuova” vita. Ti faro’ sapere. Buona giornata. Download didn’t work for me. Never got the activation email. I just responded to you via email, Marilyn! I just wrote you an email, too, Candi! Thanks for the “you rock”, but I’m beginning to think the only rocks are in me head! I am a professional procrastinator and at least 5-6 times I have gone to this pattern, but never made it. Now I’ve finally ironed the material and went for the instructions again and got into the same spiral trying to find the instructions. Each time I have to sign up again rather than sign in. I don’t know why finding the instructions is such a hassle, can you help. Hi Toni, have you downloaded the pattern? The download link changes from time to time, which is why you’re not able to visualize it if you’re using an old link. Feel free to send me an email (lisa@cucicucicoo.com) so that I can go in and cancel any extra subscriptions to the newsletter that you may have and send you a current link so that you can download the pattern! 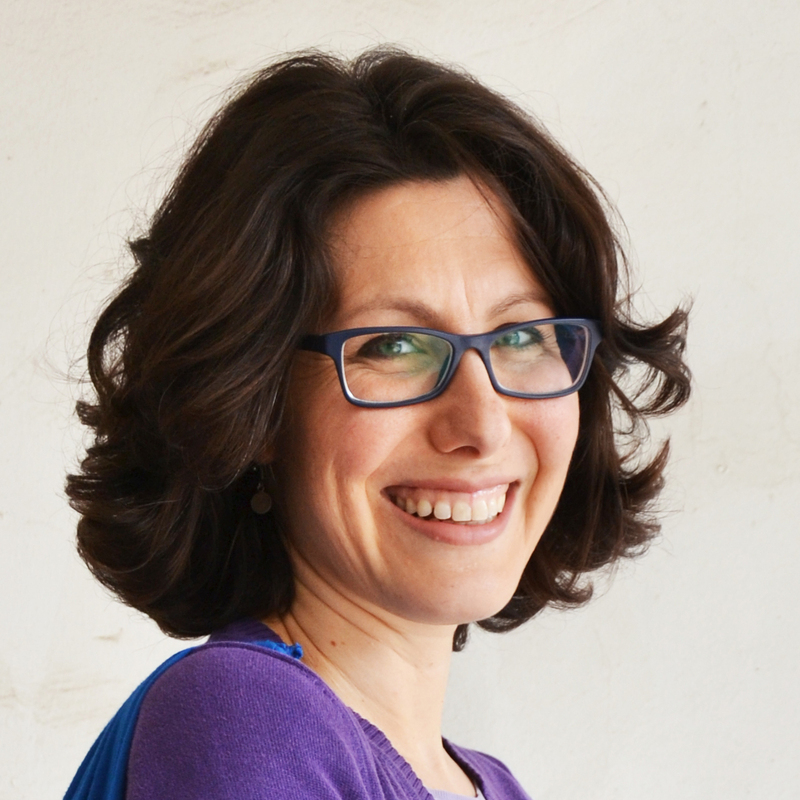 Welcome Anne-Marie! I have just reponded to you privately. Brilliant idea to reuse old umbrellas! I’m looking forward to checking out the pattern. Thanks! Ho appena finito di fare questa splendida borsa (sarà un regalo di Natale). Sei veramente SUPER. E’ spiegato benissimo. L’unica difficoltà l’ho avuto piegando la stoffa dell’ombrello!!! Non riuscivo a farlo nella maniera giusta! Questa è la prima borsetta ma sicuramente non l’ultima, voglio farla anche per me!!! Grazie ancora!! Thank you for creating this pattern! I made this bag over the weekend from an old bedsheet and am very pleased with the result. Because it was not a synthetic, it folds and unfolds with a little more trouble. I think I only skipped the boxed bottom because I couldn’t quite visualize it from the instructions. I’m now going to try umbrella fabric. I found a small umbrella with a colorful pattern. (Because it is small, I’ll plan to give it to a child.) Can anyone say anything about how slippery the fabric is, and how to work with that? I’d also like to try using a thin shirt whose collar is worn out. Any suggestions about making certain there’s enough fabric? This is my first time reading this page, so I will look carefully to see if anyone has already addressed this. Hi, Dave! I’m so glad to hear that you made the bag! Yes, the thicker fabric (thicker than umbrella fabric, anyway) is harder to stuff into the bag, but the instructions mention that and suggest making the stuff bag slightly bigger. There is also a link to my tutorial on sewing boxed corners, and that should make it clearer. If you’re using a smaller umbrella, make sure to scale down the pattern when printing it. I wouldn’t go any smaller than 75%. As for using the shirt, that’s a great idea! Just put the pattern pieces on top of the shirt, again with the pattern scaled down if necessary, and you’ll be able to see if it’s enough or not. I’d love to see pictures of your bag/s! If you take any, could you email one or two to me at lisa (@) cucicucicoo.com? Happy New Year! I will send pictures when I take them. We had a period of heavy rain here, and I found quite a few discarded umbrellas in a shopping district. So many nice colors! So few of them full size, though. I did make one from black umbrella fabric and it looks very sharp. I like how you, Lisa, incorporated the seams of the umbrella into a smart-looking diagonal on the bag. I had a tip while making it, but forgot to write it down! I’ll post it here when I make my next one. Yes, it’s true, Dave, that people tend to use mostly the smaller compact umbrellas, which also tend to break more easily. Yes, I love how the diagonal seams look, too! I just finished 2 more, one of them from a mini umbrella. Step 4: If the umbrella has different colored panels, I align the pattern so that I will get the color scheme I want in the final bag (white face with blue sides, etc.). If the velcro/snap strap interrupts this alignment, I remove the strap carefully, with a seam ripper. Also, the pattern will not always line up with the fabric at the folds. 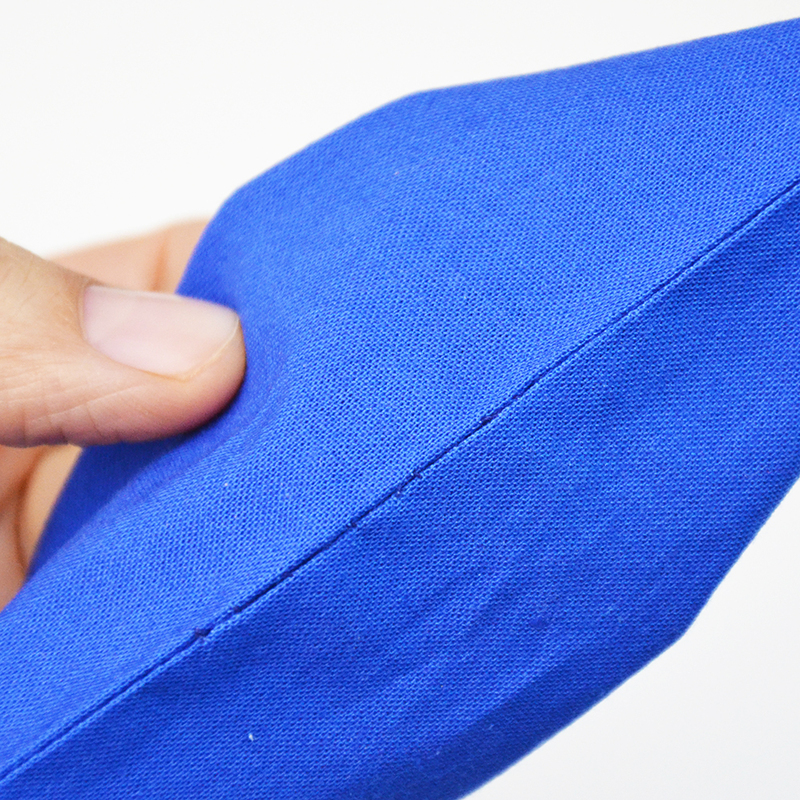 The fabric, when folded and pressed, will sometimes present a curved edge. I just line up the top or bottom of the pattern as best I can. This doesn’t seem to make a difference at any time later. 15: If the cord is a synthetic, I will melt the tips over a flame so that the cord will not unravel. 21: I have been cutting through the pouch cord here. 22: Because one cord actually came out during this step, I am now back-stitching over the cords multiple times, to hold them in place. 26-7: I tend to improvise the measurements here, based on how the fabric tends to fold. 31: I do some extra zig-zag stitching across the handle, since I’m thinking it will get a lot of stress from heavy loads. It’s not as clean-looking, though. I’m taking a break from these for a while. 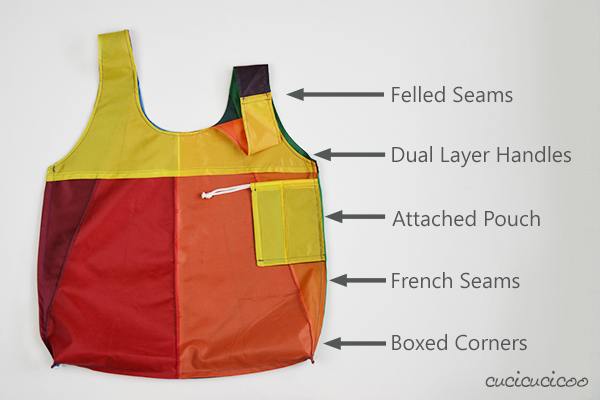 I will then try making one with umbrella fabric, but with minimal ironing. The fumes were very annoying, and probably not good for me. Buongiorno, non riesco a trovare il cartamodello da stampare. Tessuto tolto, lavato e asciugato! !